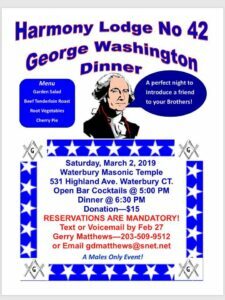 George Washington Dinner – The Grand Lodge of Connecticut A.F. & A.M.
Join us for our famous annual dinner in honor of Brother George Washington! Dress is jacket & tie. Open to brothers and non-mason males! Reservations required. $15 donation. Cocktail hour to begin at 5p with dinner to follow at 6:30p.